The participation of community members and road users in selecting essential roads for rehabilitation create a sense of ownership. Photo credit: Abir Abdullah/ADB. In the northern Rangpur and Mymensingh regions of Bangladesh, roads that link rural communities to national and regional highways are in poor condition. These “feeder” roads have been limiting rural communities’ access to markets, education, and public facilities in commercial centers. Other roads in good condition face a daily onslaught of vehicles carrying heavy loads of passengers or freight. They also witness several vehicular crashes every day. The roads are prone to damage and deterioration and may not keep up with the daily assault. Bangladesh needs to take better care of its roads and curtail road crashes, while improving the connectivity of its road network to link the rural poor to more economic opportunities. Bangladesh’s road network has grown over the last two decades, steadily expanding to cope with the rapid increase in demand for road transport. Primary roads are managed by the Roads and Highways Department within the Ministry of Road Transport and Bridges. Secondary roads, including rural and minor feeder roads, are managed by the Local Government Engineering Department within the Local Government Division. Road condition, capacity, and network reach have substantially improved, due mainly to international financing from major aid agencies, totaling $1.8 billion. Since 1977, ADB has provided 12 loans totaling $931 million. These coordinated efforts contributed considerably to meeting the growing demand for roads. The road sector’s steady growth, however, is constantly threatened by insufficient resources for road maintenance and frequent road crashes. In the late 1990s, the allocation for routine and periodic road maintenance of primary roads decreased annually, while road fatality rate has been the highest in South Asia. Accidents are mainly due to speeding, overloading, and overtaking by motor vehicles. Road traffic is made more complicated by the free and uncontrolled movement of animal-drawn carts and a lot of slow-moving vehicles. Other road sector problems include the lack of proper driver education, inefficient enforcement of traffic laws, nonpractice of regular vehicle maintenance by motor vehicle owners, and poor roads alignment and geometric design. In 2002, ADB approved the Road Network Improvement and Maintenance Project to assist the Government of Bangladesh in improving transport efficiency and strengthening integrated road networks. The project improved a total of 152 kilometers of regional and feeder roads in Rangpur and Mymensingh; initiated road safety measures and activities to reduce backlogged road maintenance tasks; and helped ensure long-term financing for road maintenance. Extensive participatory processes were employed in selecting the project roads for ADB’s Road Network Improvement and Maintenance Project. Relevant laws and policies were formulated and enacted to support the project and to improving road safety and road maintenance. The project fully reconstructed 48 kilometers of the regional Mymensingh–Nandail road and about 104 kilometers of feeder roads: Jamalpur–Dewanganj (25 kilometers); Muktagacha–Chechua (7 kilometers); Mithapukur–Madhyapara (24 kilometers); Thakurgaon–Ranisankail (36 kilometers); and Saidpur–Parbatipur (12 kilometers). Roads were also widened and substandard curves corrected. Nine bridges were also rehabilitated. Selecting the roads that would effectively link rural farmers and communities to markets and economic opportunities was a crucial part of project planning. A feasibility study assessed 27 roads in Rangpur and Mymensingh, following criteria that was established through extensive consultations with various stakeholders, including government officials, road engineers, NGOs, transport operators, public representatives, and common road users. The criteria included social aspects such as population density and literacy level, economic aspects such as unemployment level and income sources, road condition and traffic such as roughness and road use by non-motorized vehicles, level of completion of road network loop, and stakeholders’ recommendation. Of the 27 roads assessed, 17 were deemed technically and economically viable. Of these, 6 were selected as the project roads based on their potential contribution to economic growth, as well as likely poverty impact, adverse environmental impact, and social and resettlement implications. To jumpstart the government’s initiative to focus on road maintenance, the project conducted periodic road maintenance of select roads. The roads were chosen using the highway design and maintenance standards model in the Annual Road Maintenance Plan. Civil works for road maintenance began in 2006 and completed in August 2010. A total of 391 kilometers of roads underwent periodic maintenance in project areas. A performance-based contract for a 3 to 5-year period was used to introduce efficient practices in routine road maintenance works. This covered 50.5 kilometers of roads in the project area. These were completed in June 2011. The project installed axle load control stations to protect roads from wear, and addressed black spots or crash-prone areas along the project roads and other selected roads. An education and public awareness campaign for road users and pedestrians, as well as a road safety audit were also conducted to ensure compliance with road safety requirements. About 204 kilometers of roads were audited for road safety. Both civil works and public awareness campaigns were implemented from October 2010 to April 2011. The project required a feasibility study on private sector investment for road maintenance activities, the results of which can serve as the basis of a time-bound action plan to be developed by the Roads and Highways Department. Although the department was unable to prepare an action plan, efficiency of road maintenance activities improved with the introduction of performance-based contracts and the outsourcing of maintenance works to several private sector owned and operated equipment rental companies that have emerged since the project was approved. Mechanisms to financially sustain road maintenance in the coming years are being put in place, including setting up a road maintenance fund using road-user charges. The Roads Fund Board, established through the Roads Fund Board Act, will manage the fund and ensure the efficient and transparent use of the maintenance budget. The government and ADB also agreed on a 10-year maintenance financing strategy that should also lead to a reduction in the maintenance backlog. The Government of Bangladesh pursued the formulation and enactment of several laws and policies to support the project. The 1925 Highway Act was updated in 2001, and the 1984 Motor Vehicles Ordinance was amended in 2004. These legal instruments support the regulation of traffic movement throughout the country and help mitigate traffic congestion on major road networks. The government also enacted the Roads Fund Board Act in 2013 to support the establishment of the Roads Funds Board, and the creation of a road maintenance fund as its source of revenue. It also spelled out the composition and general duties of the Road Fund Board, and the preparation and review of the annual road maintenance program of road agencies. The 10-year maintenance financing strategy agreed upon by the government and ADB should also lead to reducing the maintenance backlog. The Road Safety Cell under the Bangladesh Road Transport Authority developed a comprehensive highway code in 2009 that set out rules for road users, including guidelines for safe driving and illustrated guides for road safety education. The Road Safety Cell also acts as secretariat to the National Road Safety Council, which formulates road safety strategic action plans to support the government’s initiative to improve road safety. ADB’s Road Network Improvement and Maintenance Project provided better and safer roads and improved connectivity among many rural communities in Bangladesh. Traffic has increased on the completed project roads, which provided greater ease of movement of people and goods. Travel time to the nearest markets, health services, and schools has been reduced. The project has generated an increase in traffic on the completed project roads, with annual average daily traffic at 3,269 vehicles per day. Ride quality on project roads have also improved, while vehicle operating costs decreased by 20%. The government has also increased the road maintenance budget. The allocation for routine road maintenance increased from Tk 741 million (US$ 9.1 million) in 2007 to Tk 2.7 billion (US$ 33.4 million) in 2012. The periodic maintenance budget was also increased from Tk 1.7 billion (US$ 21 million) in 2007 to Tk 4.0 billion (US$ 49 million) in 2012. 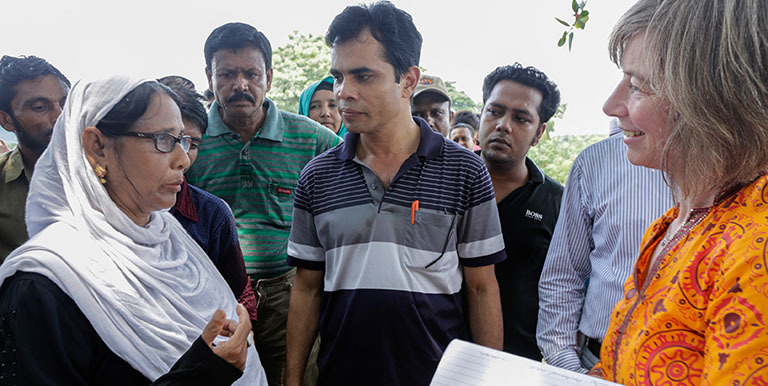 With easy access to markets and other economic opportunities, rural communities in northern Bangladesh have more prospects for increasing their incomes through better employment and increased trade and commercial activities. Reduced transport fares and freight transfer costs are expected, as bus and truck operators compete within a larger and growing market. The project also developed the market areas for local people by widening the roads with the provision of footpaths, drainage, and safety barriers. About 10.35 million people, including 5.05 million women, have indirectly benefited from the project. The project also contributed to better regional integration among countries in South Asia. The improved project roads effectively linked two national highways and strengthened connectivity with the subregional road network linking Nepal and Bhutan, which increases the potential for economic development through greater subregional trade and commerce. By contributing to cross-border transport in South Asia, the project supports the SASEC Program, which aims to promote prosperity, improve economic opportunities, and build a better quality of life for the people in the subregion. ADB’s Road Network Improvement and Maintenance Project offers lessons can be derived that may be useful to similar road development projects in the future. The road selection process involving stakeholders is a distinctive feature of the project. The feasibility study and extensive public consultations that gathered stakeholders’ opinion to identify the project roads helped ensure that the benefits of the project would be enjoyed by the most number of people. Such participatory processes should be adopted in similar road rehabilitation and maintenance projects. The establishment of the Roads Fund Board and the 10-year maintenance financing strategy between the government and ADB ensures road maintenance financing for Bangladesh in the coming years, which would reduce the backlog in road maintenance activities. Such financing should enable the Roads and Highways Department to formulate a long-term action plan that includes initiatives related to institutional capacity building, developing private sector partnerships, and improving road safety through stronger stakeholder and community participation.